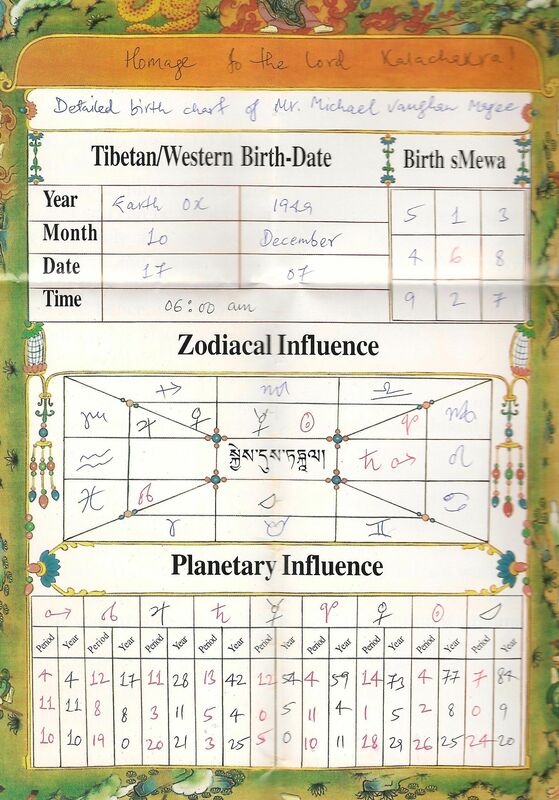 I recently received my Tibetan horoscope from Men-Tsee-Khang, the Tibetan medical and astrological institute based in Dharamsala, India, and set up by the Dalai Lama. There were a lot of surprises in there. What principally surprised me was that the positions of the planets differed marginally from Indian sidereal astrology. This is the front page of the prognosis offered by Men-Tsee-Khang. In contradistinction, here is the rashi chakra for the “seven planets” produced by the enormously wonderful Indian software, Jagganatha Horam. Lagna 24 Libra 16; Sun 21 Scorpio 25; Moon 10 Gemini 28; Mars 28 Leo 31; Mercury 4 Sagittarius 24; Jupiter 9 Capricorn 20; Venus 6 Capricorn 04; Saturn 27 Leo 10. These figures tally more or less with my own horoscope program, Astral Windows. Venus and Jupiter are in Capricorn, sidereally. But not in the Dalai Lama’s mobs’ chart. There, Venus and Jupiter have ended up in Sagittarius, although the other positions are similar. I decided to ask the astrologer a question, to which she replied, quite promptly. She said that Tibetan astrology was, like Indian astrology, a sidereal system and quite occasionally discrepancies like this occurred. This was not good enough for me. A colleague of mine, Professor Edward Henning, sent me his book a couple of years ago. Called Kaalachakra and the Tibetan Calendar (ISBN 978-0-9753734-9-1, New York 2007), this wonderful book points out the basic flaws in its calculations. Indeed, Professor Henning was kind enough to explain the anomalies to me, in personal correspondence. He told me that there was no equivalent to the ayanamsha in Tibetan astrology, and, indeed it is basically a tropical system, with the errors so great that it had somehow turned into a sidereal system – with anomalies as described above. Of course, Hindu astrologers also have a kaalachakra system too, but it is kind of different and has various different ayanamshas. No one is quite clear what the starting point is. Some mention Spica at the end of sidereal Virgo, the Hermetic Order of the Golden Dawn fixed on the star Regulus, while Varamihira, the “father” of Indic astrology based it on a star in Rohini which seems to have blanked out. And scholarship has shown that although Varahamihira’s astrology retains some Indian heritage, much of it seemed to based on astrologers attached to Alexander the Great’s invasion into the East. My own book on sidereal astrology – Tantrik Astrology – still appears to be extant.